The stories & poems we’ve collected, edited and presented for this, our third release, seem to have nothing much in common. 25 texts, by 24 authors (21 different translators), in more than 10 languages. They’re political & poetic, mystic and mischievous, vague and specific. They include all or none of these characteristics. We’ve gathered tales of blossoming and withering things. Blooming hibiscus’, swarming bougainvillea weave through the paragraphs and sentences of our newest release. Liquid stories. That spill, stain, spray, splash, cloud and uncloud. Poems that puzzle, poems that illuminate and dissolve. The one thing these texts have in common is a distinctness of voice. A note, unlike one another. A scent of their own, if you will. 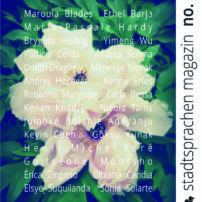 Ideally, we endeavour that these unique voices help epitomise the aesthetic conscience of the literary city Berlin.